Adding a roof to your UTV is sometimes a welcomed accessory. Whether you have owned your off-road rig for a while or maybe you just bought the ride of your dreams, there will always come a time when you want to add your special touch to the machine. There are many accessories out on the market and there are many different manufacturers building these products, so how do you know what to buy? 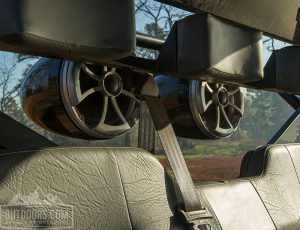 Here’s a list of my favorite ATV/UTV upgrades. Adding a roof to your UTV is sometimes a welcomed accessory. Especially on hot summer rides when the sun beats down on you from above. If you are looking for a roof be sure to get a reputable brand and always give the machines manufacturer accessory catalog a look before deciding. When a manufacturer builds accessories, they seem to fit better and come with all of the proper mounting hardware as well. 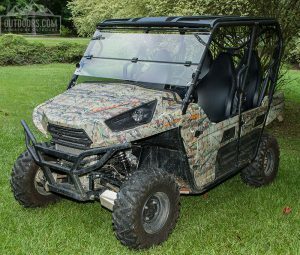 This is a very common ATV/UTV upgrade. Finding a winch that is built to handle the weight of your machine is critical. 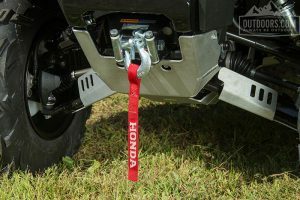 If you have an ATV, you will most likely be satisfied with a winch that is rated for 1,500 lbs. — lighter if you have a small machine. Some utility ATV’s get pretty heavy so having a little more in the winches pull rating can only help you, but it is most likely not needed. Deciding on steel cable or synthetic rope will be the next choice and that one will be totally up to your personal preference. Stamped steel or generic base model wheels on your machine may give you an inferiority complex so adding a set of cool rims and tires might be in your future. Adding some cool wheels is common but one thing to be sure of is the stock wheels offset and sizing. If you add a wheel that has a different offset or is slightly larger then you change the way the machine will handle or steer. 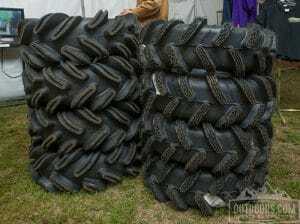 Tires will have similar effects but adding a more aggressive tread can reduce power output and cause the steering to feel heavy as well. Just be sure to stay as close to factory sizing as possible. Machines with EPS or Electronic Power steering may not feel as heavy behind the wheel but non-EPS will notice it right away. Riding in the dark is an adventure that everyone loves. It takes skill and driving prowess to navigate trails with most stock lighting, so adding extra lights makes the night trips easier and safer. LED lights are all the rage now as they use less power in most cases and provide large amounts of bright lighting. 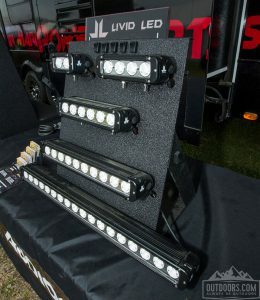 On an ATV you are somewhat limited to space restrictions so a nice 10″ wide light bar or even twin light cubes on the front rack will give you the extra light you need. 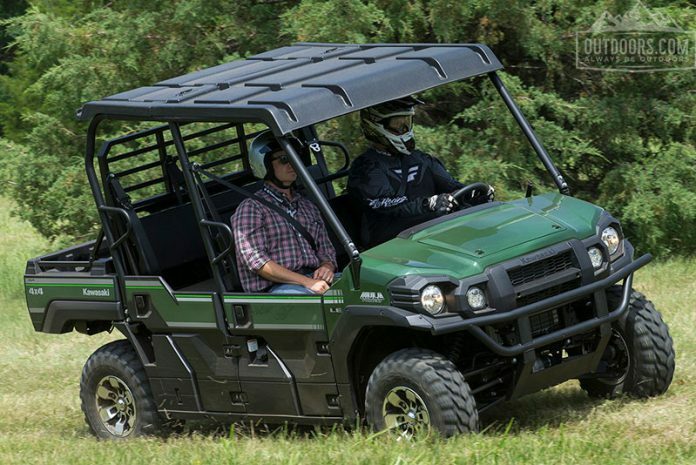 On a UTV however you can add a light bar across the protective structure that will throw a substantial amount of light. When choosing an LED light bar be sure to know exactly how much power the stator can effectively provide because you do not want to tax the system into extinction. Keeping the cool wind flowing through your UTV is a must in the hot days of summer but blocking the cold winds of winter is also important. Let’s not forget the rain that sometimes catches us off guard on the trail from time to time as well. Most major brands have their own windshields and I typically recommend using these products, as they just seem to fit better. However, if you find a great deal and the coin is the focus of your purchase then be sure to get a windshield that is made of tough scratch resistant material or your first brush with dust or mud will have you regretting your purchase. One other item to keep in mind is a good folding windshield gives you many more options for use in comparison to a solid non-folding unit. This is a debatable accessory but one some swear by. The sound system or radio in a UTV can be a great addition to any trailside pit stop or even around camp as the day burns off into the night. Choosing a radio is the hardest because there are so many elaborate units available these days. Some systems are very compact using up only minor space while other systems are almost the same as a car stereo. Just make sure the speakers and receiver are waterproof and have a Bluetooth feature in case you decide to play those MP3’s off of your smartphone. The stereo is not a must have but it is becoming more and more popular. It’s in our DNA to want to upgrade our vehicles — ATV/UTV, truck, cars and pretty much anything with a motor — we just can’t leave them stock. Just make sure the enhancements you add make the machine run better and not make it unsafe or unreliable. Have fun and ride safe with your new ATV/UTV upgrades.